In an issue of HCC five years ago, we tasked Steve May with imagining what technology and concepts would be making a name for themselves in home AV in 2017. Ultra HD and OLED were naturally tipped to develop. That Dolby Atmos wasn’t even mentioned, though, is testament to just how quickly the object-based audio format has found favour in our living rooms and picture palaces. At the beginning of 2012, Dolby Atmos didn’t exist. Once again, film fans find themselves in the midst of an audio format war. Long-time rivals Dolby and DTS are slugging it out in both commercial theatres and home cinemas with new object-based sound systems. Dolby's Atmos format matured first, launching at multiplexes in 2012 and in home setups two years later. Now, though, DTS:X is hoping to steal its thunder. Can it really be five years since a TV and movie industry desperate to find the next big tech temptation set out to entice us and our traditionally 2D AV brains into the third dimension? 'Fraid so.In fact, it’s a bit longer than that if you take the 2009 launch of Avatar as your 3D starting gun. At HCC, however, it was the Summer of 2010 when the format became a going concern, marked by the arrival in the UK of the first 3D TV sets. 2013 is fast shaping up to be the year of eight million pixels. Full HD, now ubiquitous on TVs at every price point and served up by more than 60 channels, finally has something to look up to. 4K resolution displays, built for those with really deep pockets, are finally becoming a reality. January’s International CES was a galvanising launch pad for these next-generation screens. For historical reasons, Huntingdon in Cambridgeshire has an extraordinary number of audio manufacturers in close company to one another. One of the leading lights of this cluster is Meridian Audio. Founded in 1977, it has gone about the business of product development in a fashion that's paid little heed to the trends and traditions that might be doing the rounds elsewhere. In a perfect world, there would be no need for us to employ headphones for AV use. Children would sleep through anything, your partner would be just as keen on the same films watched at the same volume as you, and you’d be separated from your neighbour by a bit of open space – Lincolnshire, for example. Sadly, this utopian vision of home entertainment is just that, and a good pair of headphones can allow you to keep using your system when speakers aren’t suitable. Light and cinema have always enjoyed a symbiotic relationship. 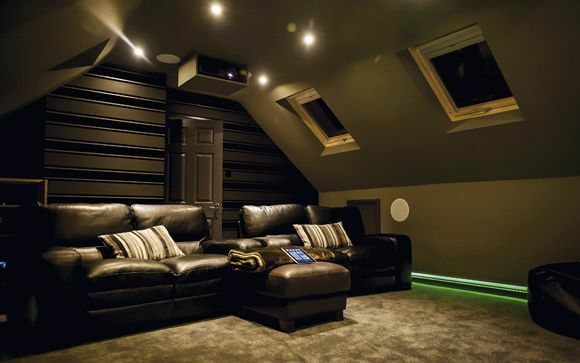 Without the former, our flickering home theatres would be little more than gloomy sheds with extravagantly comfortable seating. A well-designed lighting system can really help deliver that 'wow factor' that we want our cinema setups to provide – especially if you want the room to rock even when you're not watching a movie. Armed with an Arcam AV860 processor and platoon of disc players, we sample the first IMAX Enhanced disc release, Journey to The South Pacific. We’ve all been there. Grovelled around the back of an AV system looking for the plug that needs jiggling in its socket to restore a mysteriously lost connection. We’ve trodden on a plug, and broken it, and so made an expensive cable useless; or broken the little plastic lock leaf on the RJ45 plug at the end of a carefully-laid Ethernet network cable. Worse still, we’ve tripped over a lead, wrenched the plug and broken the socket in a pricey piece of gear. And how many smartphones and tablets have been wrecked by someone pushing the USB connector home the wrong way round? What a wonderful world it would be if connections no long relied on plugs. Is the future of home cinema RED or Blu? When Universal Studios announced earlier this year that it was to release Schindler’s List on its twentieth anniversary as a special edition Blu-ray, the PR blurb was all about how the 35mm film original negative had been meticulously restored in pristine high-definition. More importantly, Steven Spielberg's 1993 classic was actually scanned to create a 6K master, then downscaled to 4K for the restoration, and down to lowly 2K, or 1080p, for the Blu-ray edition.